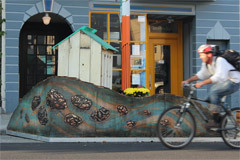 The Luna Rienne Parklet (formerly fabric8) is a venue for public art. Rotating exhibitions - from installation to murals to landscaped plants and greenery - are designed by our featured artists. Please visit our current website for more information. 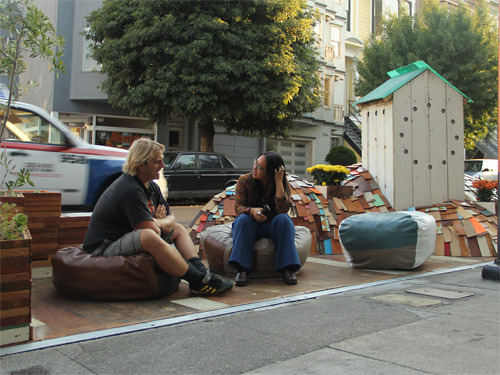 The parklet features portable seating during the day, which is brought inside after gallery hours. To build and maintain the Parklet Gallery, as well as to facilitate artist stipends, we are seeking donations from individuals and organizations. The first installation was completed in September 2011. Titled The Peace Keeper, it was designed and built by San Francisco artist Erik Otto. Many thanks to those who have donated their time, materials, and money to this project. Please visit the Patrons Page for a complete list.